I first clicked on a recipe for Chinese scallion pancakes because the name sounded so intriguing. I had never had scallion pancakes before, and I thought a pancake with scallions in it would be quite bizarre. As I found out, they’re a typical Chinese dim-sum and not actually a breakfast food. They’re also really tasty, easy, fast, and make a great lunch topped with some sautéed mushrooms, onions, and spinach. I’ve changed the original recipe a little, and I don’t know enough about traditional Chinese dishes, but I’m betting they’re no longer true, classic “scallion pancakes”. Especially since I’ve opted out of using scallions. In a large bowl mix your flour with half (1/8 cup) of your water and the melted butter. If you wish to use a stand-mixer, then use the hook attachment and mix on low. Stir until the water and butter are absorbed. Keep adding water a little at a time and mixing thoroughly until your dough pulls away from the sides of the bowl. Your dough should be firm and barely sticky. Remember that any additions of flour or liquid take time to work into your dough, so make sure you mix it well before adding more. Keep kneading the dough, either by hand or in the mixer until smooth and elastic. Roll your dough into a ball and cover with a damp towel (or plastic-wrap) for 15 minutes. After it’s done resting, cut your dough into 3 even pieces (or more if you want smaller pancakes) and roll the pieces into balls. Take a ball of dough and roll it out into a thin circle (maybe a few millimeters thick) on a well floured surface (though, I’ve found that mine don’t stick too badly, so I don’t bother flouring). Spread a bit of olive oil over the surface of the pancake, just enough to coat it, and sprinkle salt liberally. Place 1/3 of your finely chopped onions (the finer, the better) in a line about half an inch from one side of the pancake. Then, like a burrito, roll the pancake up from the onion end to form a tight tube. You may wish to pinch the ends closed so that your onions don’t squeeze out. Then, curl the roll around in a spiral, like a cinnamon bun, and pinch the end to keep it wrapped. Roll out the curled pancake to about 1/8 inch thickness. Oil and onions will come out as you roll, but don’t worry, just press the onions back on, or toss them in the pan later. I like to top my pancakes with leftover onion bits, mushrooms, and spinach lightly sautéed in a vodka-cream sauce. They are absolutely delicious plain, as well. 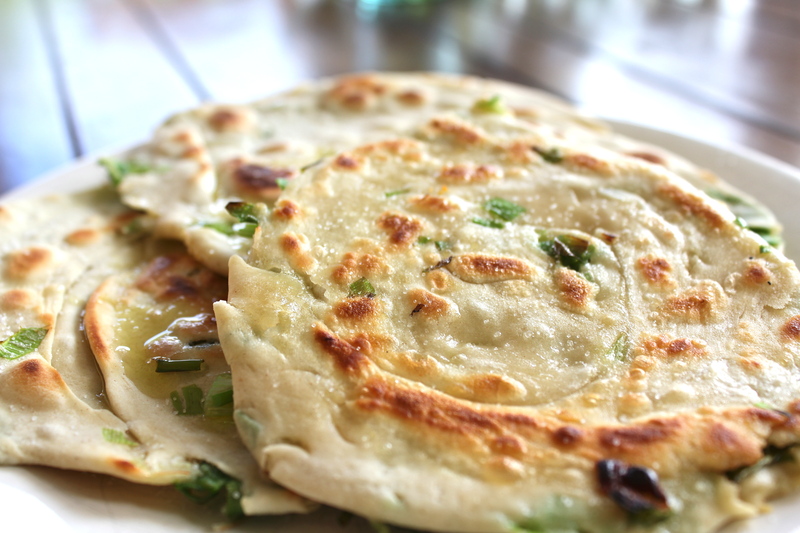 The first time I made scallion pancakes, I followed a traditional recipe and actually made it with scallions. I did forget to salt it, however, and since I was absolutely famished, I undercooked them, as well. Perhaps it was some combination of those two mistakes that led me to alter the recipe, but I also found that the scallions were just too thin and insubstantial; I wanted something a little more, well, more. So I opted for onion and I threw in some butter because, really, you can’t go wrong with the stuff. This is now one of my favorite recipes to make (and eat). It’s fun, easy, and quick. The dough is incredibly non-fussy and forgiving; it’s definitely an eye-ball kind of recipe. These pancakes are one of those things that you make once and immediately remember how to make the second and third time. Plus they’re gorgeous and incredibly tasty! *I’m including the original recipe because it’s worth trying out and also has wonderful photos showing how to make these step-by-step. The photos on this post are from the first time I made them, following the traditional recipe.